Stone and wood home with fireplaces and a fully equipped kitchen, windows opening to undeveloped hills and grassy fields, no urban noise, no cars passing by, just frogs at night croaking in the pond below and birds chirping in the morning. A new and fantastic heated (!) swimming pool has been added - 4 meters x 13 meters, ideal for laps or just playing. It is protected by an electric sliding cover which is invisible (submerged) when opened. Enjoy it after your stops at historical chateaux in the vicinity. or hiking in the countryside of Dordogne Perigord Vert. Our country house Le Puy Chapon is a family home full of history. It is part of a hamlet of four stone houses perched atop a hill overlooking a valley watered by a stream, the Ravillou. Long ago Le Puy Chapon housed the farm manager for the local land owner living a few hundred metres away. It is renovated for comfort but retains it's charm and offers an exceptional view. Many acres of pastures surround the property making it a quiet and secluded heaven troubled only by the daily passage of the postman! Do note that there is NO plasterboard or 'modern' building materials used in the house. It is an authentic farm house with beams galore. The swimming pool, on the other hand, is top of the line and extremely high tech. It is surrounded by a wide terrace covered with natural stone. A master bedroom overlooking the valley, a quiet bedroom on the same floor, two upstairs bedrooms with overhead beams and unencumbered views over the hillsides. Slightly downstairs is a fully equipped kitchen and stairs leading to a large living area and patio. Thick stone walls. There is a washer and dryer, large outbuilding for your car and smaller undeveloped house for kids to explore. Sheets and towels are provided. The kitchen is stocked with starter coffee (ground), tea bags (if you like loose tea, do bring a supply), olive oil and balsamic vinegar as well as a bottle of rose wine to get you off to a good start ! There is a small store in the village (3km) and a major supermarket in Excideuil (8km). My cousin lives in a village 3 km away above Saint Germain des Pres, there is an English family in the hameau nearby, a Belgian gentleman and a French couple. That's the circle - unencumbered but not totally isolated. Corinne, a local caretaker, will welcome you and help you get started. I love to travel and discover new horizons but I especially appreciate coming back to my family home in Dordogne. Nowhere have I found such calm and authentic culture. Le Puy Chapon is my family home but I cannot live there for the time being. I treat it as my own home and have added modern aspects to the property while maintaining it's authentic side. I hope to provide you with the same love of nature and old stone dwellings while, at the same time, share the new things like a huge heated pool, good TVs, new appliances and comfortable beds. The area is populated by pleasant people mainly native to this region. The nights are starry with no city lights to distract. There are lots of interesting chateaux such as Hautfort to visit and historical caves to see including Lascaux, the most famous of all. Walking in the countryside around the house is fantastic, but you can go horse riding, play golf or visit local markets in Excideuil and shop in Perigueux. You can visit all the prehistoric sites of Périgord and castles, Le Bugue, Sarlat, Montignac Caves of Lascaux, Bergerac vineyards, and Monbazillac, the old towns of Bergerac and Périgueux, walks in the town of Montagnac la Crempse, Old of the 16th and you will be able to appreciate the products of the soil. Fantastic guests and excellent personal contact. Hope to see you and your family next year! The house is tucked away at the end of a quiet hamlet and is very peaceful, with a gorgeous pool with wonderful views. The house itself is cool and comfortable with plenty of space. There is a double bedroom, a single bedroom, a room with twin beds, and a narrow double bed, so the house really sleeps 6, and only 7 if there are 2 couples. The single beds in the room with twin beds are attractive old wooden beds but not very comfortable and more comfortable beds would be a good improvement. The only other potential drawback is that there are lots of steps up and down between the different levels in the house so this would not be a great house for parents with toddlers! But there was always plenty of piping hot water, the linen was lovely and clean, everything was in good working order, The pool was divine, the deck loungers very comfortable, there is a good awning for eating in the shade beside the pool & there is even a poolside shower. A lot of thought has gone into making this very attractive and welcoming. We loved it and certainly hope to return. Thank you for your comments. They are very much appreciated. 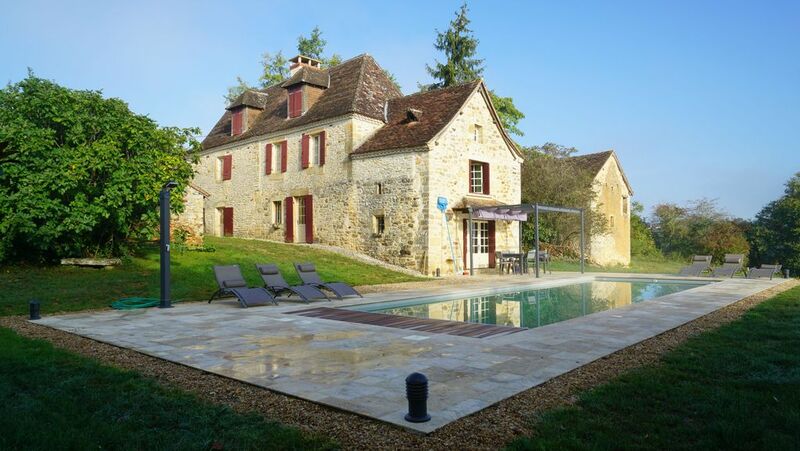 Cadre et maison charmants, magnifique Piscine. Confort rustique de la maison. Maison de famille accueillante, vivante dans une region pleine de charme. Une seule vraie salle de bains 🛀� opérationnelle, beaucoup d’escaliers pour accéder d’une pièce à l’autre, isolation et literie un peu rudimentaire à l’étage ... pour les bémols. J'espère vivement vous revoir auPuy Chapon où je tenais à vous le préciser, une piscine chauffée sera installée l'été prochain.